monkeyink:blog: Renegade Craft Fair SF this weekend! Packing up for another fun time mini art gallery at Renegade Craft Fair! Come see us if you can! 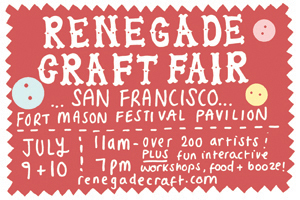 On July 9 + 10, 2011, from 11am - 7pm, The Renegade Craft Fair will return to Fort Mason Center Festival Pavilion for our 4th Annual San Francisco Fair! The best makers of handmade goods from the Bay and beyond will assemble for our free-to-attend marketplace celebration of indie-craft culture!